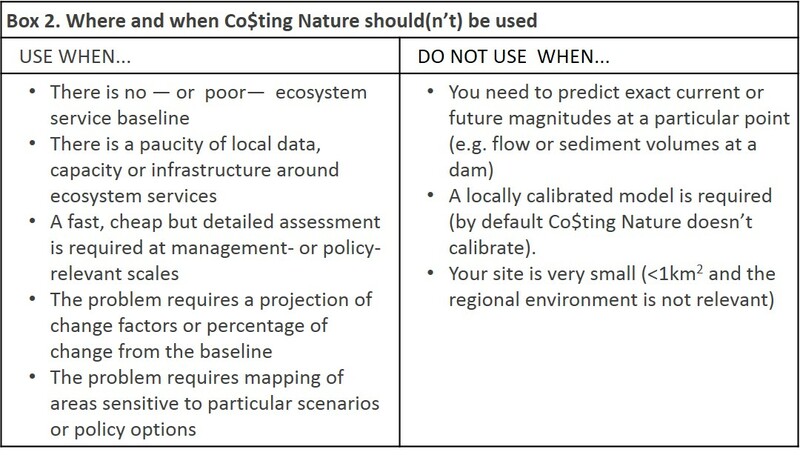 Co$ting Nature, developed by Dr Mark Mulligan (King’s College London) in collaboration with AmbioTEK and UNEP-WCMC, assesses ecosystem services (ES)—the benefits people obtain from nature  — provided anywhere in the world, identifying their beneficiaries and assessing the impacts of human interventions and scenarios (Box 1). Co$ting Nature provides policy support for the sustainable management of ES through the definition of conservation priority, based on the spatial distribution of ES, critical ecosystems and current human pressures as well as future threats . Currently, nearly a third of the species assessed by the IUCN Red List are threatened with extinction . Around 60% of the ES evaluated by the Millennium Ecosystem Assessment had been degraded or used unsustainably a decade ago. The recently developed Red List of Ecosystems estimates that 27 of the 32 assessed ecosystem are threatened with collapse. Clearly, we need to find a balance between human well-being and maintenance of natural environments. This difficult task involves multi-level decision-making — from international laws to individual lifestyle— that relies on scientific evidence. However, decision-makers face major challenges when it comes to obtaining and applying the evidence. Some of these challenges are lack, inaccessibility and uncertainty of data. Even when data is available and accurate, if highly specialized knowledge is required to interpret it, or it cannot be applied under the expected scenarios for change, it becomes difficult to use . How does Co$ting Nature support decision-making? Co$ting Nature overcomes these challenges by bringing data and knowledge together, in a user-friendly system, for conservation and development governmental and non- governmental organizations, policy analysts, agriculture and industry, education and academic researchers. Here, spatial datasets from remote sensing (e.g. forest loss and gain, carbon stock) and other global sources (e.g. biodiversity hotspots, urban areas) are provided to model several biophysical and socioeconomic processes, to calculate a baseline for ecosystem services anywhere globally. Users can include their own datasets if desired. Also, it allows a series of interventions or scenarios of change to assess their impact on ES provision (see Box 2). Relative biodiversity priority index – combines relative richness and relative endemism for red list (threatened) species for the groups mammals, amphibians, reptiles and birds. Relative aggregate nature conservation priority index (potential services) – this combines total potential services (all services) and total nature conservation priority (which combines the relative conservation priority index with the biodiversity priority, current pressure [Fig. 1A], and future threat indices [Fig.1B]). Potential services are provided but not necessarily consumed, but they are available for in the future. Relative aggregate nature conservation priority index (realised services) – this combines total realised services (Fig. 1C) and total nature conservation priority. Unlike potential services, here the calculations depend on demand for services as well as supply (Fig. 1D). Co$ting Nature does not value nature in monetary terms users can employ Co$ting Nature outputs to apply their own valuing criteria. Figure 1. 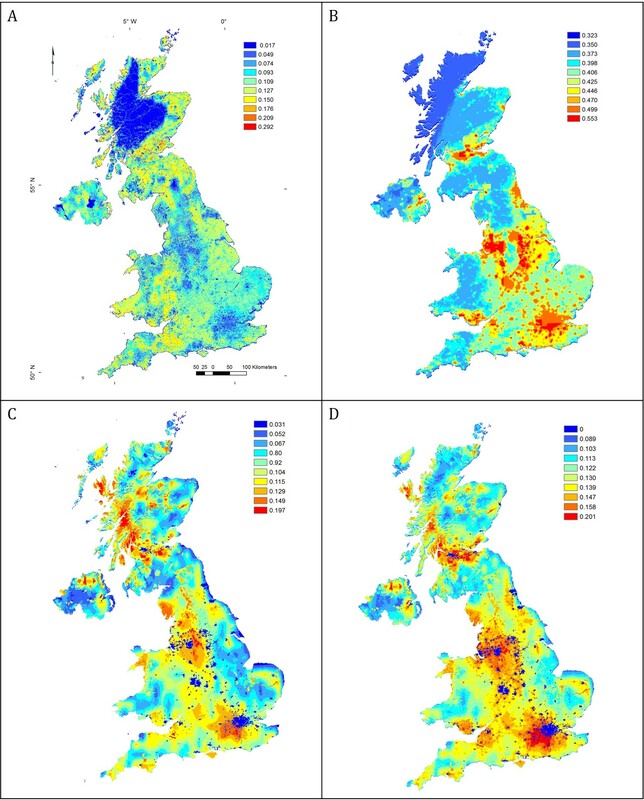 Examples of Co$ting Nature output maps indexed globally (0 – 1) based on different calculations and indicators  at country scale (United Kingdom). Top maps show areas under current pressure (A) and susceptible to future threats(B). Bottom maps show areas of current (total) realized service provision (C)— used by people— and with overall conservation priority (D). 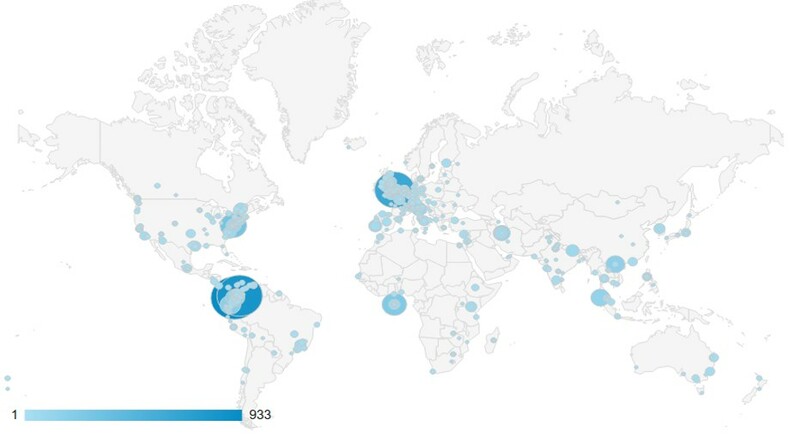 Currently, Co$ting Nature — along with the other Policy Support Systems by the same developers— is used by 1200 users of over 1000 organizations in 141 countries around the world  (Fig. 2). The main applications of this tool include baseline ES assessment, general analysis of pressures and threats on services or biodiversity, specific planned agricultural, industrial or extractive interventions and co-benefits analysis. An example of co-benefit analysis was presented by Kelly Gunnell (King’s College London) in the symposium Space – the final frontier for biodiversity monitoring?, hosted by the Zoological Society of London (29 April 2016). Here, Gunnell and Mulligan used Co$ting Nature to asses the potential ‘co-benefits’ for biodiversity of areas of natural green infrastructure in five global cities. Initial results show high spatial correlation between biodiversity and green storage, but further research is required . The relationship between natural infrastructure and species richness is one among many questions that can be answered using this tool. Co$ting Nature developers provide several examples of applications. 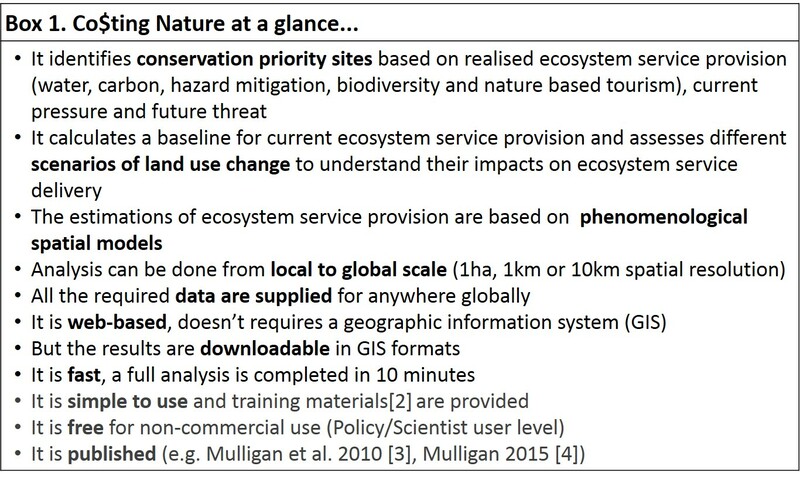 This entry was posted in Earth Observation, Ecosystem Services and tagged Conservation, Costing Nature, Ecosystem Services by Molly McCullough. Bookmark the permalink.